During The First World War, in 1916, The Province of Ontario in Canada purchased a plot of land in Orpington upon which they built and equipped a Military Hospital. The hospital was run and staffed by Canadians and during the period to when it was demobilised in 1919, it treated over 30,000 Canadian, British and Commonwealth troops and astonishingly only about 200 died of their wounds and illnesses. The hospital staff were major pioneers in the field of plastic surgery. All Saints’ Church were approached by the hospital regarding those who did not recover, and who they wished to be buried in consecrated ground. Fortunately All Saints’ had purchased a large plot of local vacant land in 1913, adjacent to the church, because its own small churchyard was almost full. They gave a piece of this land to the Canadians, which was referred to as the Ontario Cemetery. The locals preferred to refer to it as “The Canadian’s Corner”, and whilst our archives show that there was some resistance to this, the latter name survived, and now it is referred to as Canadian Corner which is accepted by everyone. Orpington is part of the London Borough of Bromley, who decided that they ought to commemorate places and events relating to The First World War. As part of this, they unveiled a memorial information board at Orpington Hospital, which stands on the site of the old Military Hospital and which served as the town hospital until the early 1980’s when it was demolished. They also renovated the clocktower which was a feature of the Canadian Hospital. This now stands in the present hospital site. It was suggested to the church, in view of our link with the Canadians, that we might like to do something relating to Canadian Corner, and it was decided that an information panel would be erected by the entrance gates. This would be appropriate as, despite it being obvious that it was a war graves area, there are gravestones with the Maple leaf carved in them, and there are gravestones of other Commonwealth soldiers, and many British Regimental Badges carved into gravestones too, the information panel would explain exactly what was there, for this and future generations. It is maintained by the Commonwealth War Graves Commission. It was decided that there would be a service during which the information board would be unveiled by the Mayor of Bromley. From our archives we produced an Order of Service from 1921 and based our 2016 service on this. This service was when the stone cross/cenotaph in Canadian Corner, identical to those in France and Belgium, was unveiled and blessed. Bishop James was invited to lead the service and we were so pleased that he agreed. We were able to agree a date convenient to him, the mayor of Bromley, the Canadian High Commission , and Paul Wright our Archdeacon. It was also decided to hold an exhibition of items from the archives of the church and the local authority, and which would be available after the service, and which would be held in what was the nave of the 12th century part of the church. The whole event would be completed with a buffet lunch in the church hall. Despite weather forecasts for the 30th April not being very encouraging, the weather on the day was perfect. About 130 people attended the service both invited guests and members of the church and the public. 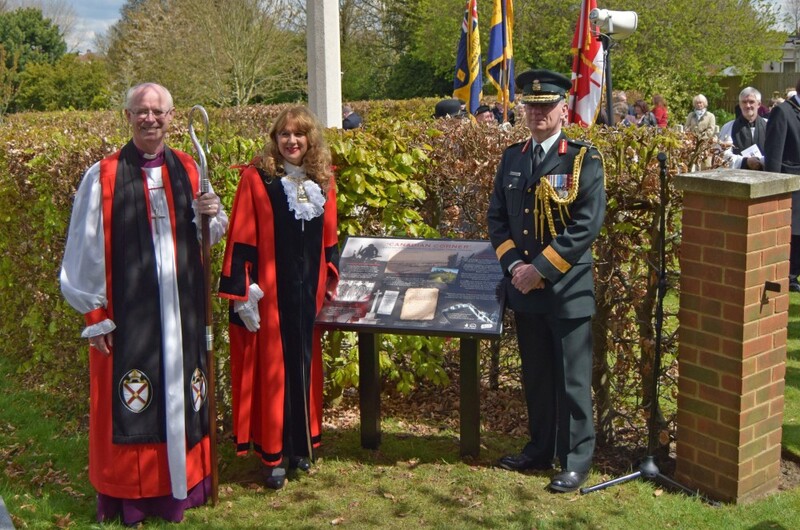 Following the unveiling of the panel by the Mayor of Bromley, Councillor Mrs. Kim Botting, she gave a short address regarding the WW1 commemorations. Following this, Bishop James blessed the information panel and gave his own address confirming the link between the Canadians and Orpington. Finally there was a response from Brigadier-General Matthew Overton representing the Canadian High Commission. Wreaths were laid by the Brigadier-General and the Mayor. Following the service Bishop James blessed a tree that had been planted in Memory of one of the soldiers buried in Canadian Corner. He was Victor Lilia. He was born in Finland and emigrated to Thunder Bay in Ontario. Following the outbreak of war, Victor enlisted. He died in the Military Hospital in 1919. The tree had been planted on behalf of the City of Thunder Bay Council, not only in his memory, but by way of thanks the people of Orpington. In a storm on Christmas Eve 2013 a yew, estimated by tree surgeons to be 1000 years old, was blown down. This has now been replaced by a maple tree in view of our Canadian connection, and this too was blessed by Bishop James. In the lobby of the old hospital there was a wooden carved replica of the Coat of Arms of Ontario. When the hospital was demolished in the early 1980’s it was rescued by the Royal British Legion and had been stored in a territorial/ army cadet centre since. The church took custody of it some 2years ago and two of our congregation John and Angela Pentlow have carefully restored most of it as it was in a poor state of repair. This too was blessed by our Bishop. The exhibition that followed showed items from our archives and from the archives of the Borough of Bromley. The Friends of Orpington Hospital loaned copies of photographs of the hospital including the ward, the operating theatre, the X ray department, the plastic surgery department, the theatre, workshops, snooker hall etc. Also pictures of the visit of King George V and Queen Mary during the war. The Main Canadian Barracks in WW1 were at Shorncliffe near Folkestone and through which 650,000 Canadian troops passed. The Shorncliffe Trust exhibited militaria including rifles, gas masks, uniforms and day to day soldier’s equipment. We had movie film of the time. Local footage supplied by Orpington Film Club and troop movements and related film by courtesy of the Canadian National Archive. Personal details of many soldiers was displayed and contained photographs, letters, pay books, postcards, Death and burial certificates and copies of the notifications, the dreaded telegrams received by the families. These were with the kind permission of Doctor Stephen Davies of the Vancouver Island University, through their website Canadian Letters ca. One of our local primary schools, via their History Club, entered a competition we ran, to design a stained glass window. We had 15 entries from the club and very good they were too. All the children received a certificate and a small prize. Larger prizes being awarded to the two best entries. All our main guests, Bishop James, the Mayor, the Brigadier-General and the Archdeacon joined us and the majority of the attendees for the buffet in the Church Hall, with this social gathering rounding off a very good day. Chairman All Saints’ Church Canadian Corner Centennial Commemoration Event.